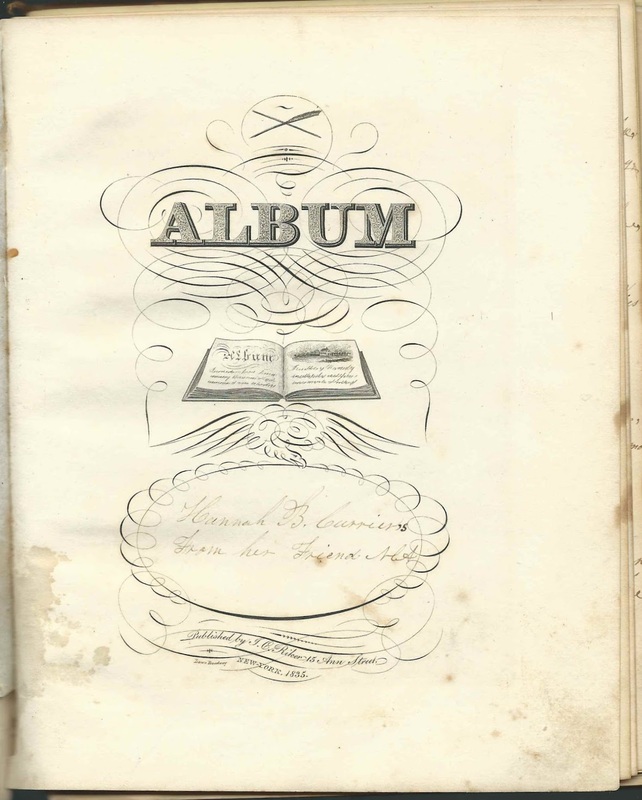 Autograph Album presented about 1836 to Hannah Ballard Currier of Farmington, Maine, by her future husband Nehemiah Curtis Alexander of Harpswell, Maine. 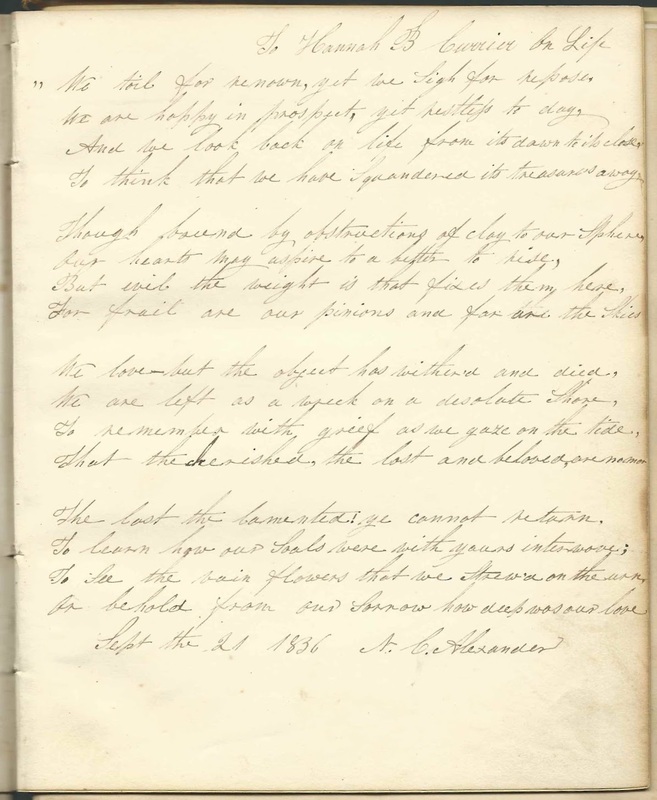 Nehemiah Curtis Alexander may be the "Friend" who inscribed the first page after the title. 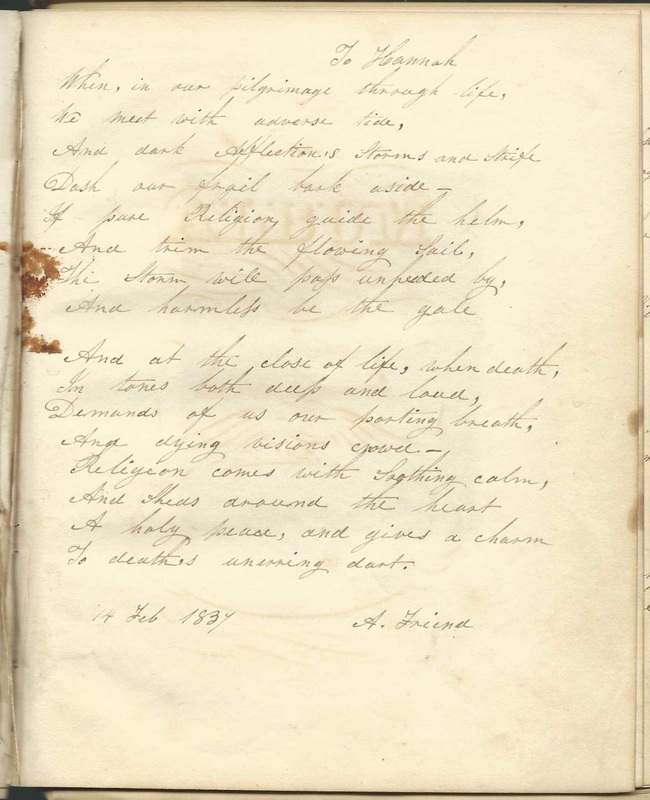 And he inscribed another page, as N. C. Alexander on September 21, 1836. Click on an image to enlarge it. 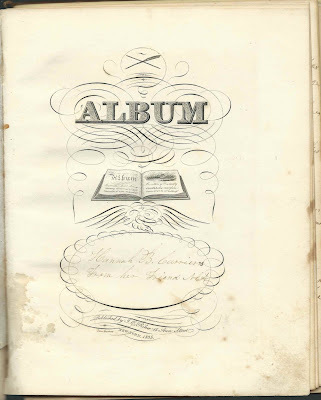 The album measures approximately 7-3/4" x 6" and contains the sentiments of possibly as many as 16 of Hannah Ballard Currier's relatives and friends, assuming no one inscribed more than one page. An alphabetical surname list and an alphabetical list of the inscribers, together with any personal information they offered, appear at the end of this post. The album was published by J. C. Riker of New York and contains five engravings. Interestingly, there's a tintype tucked in, sadly not identified. Could it be one of Hannah's daughters with Nehemiah? Interestingly, it appears that Hannah and Nehemiah named one of their daughters after Nehemiah's niece Louisa Bishop, daughter of Capt. John S. Bishop and Margaret (Alexander) Bishop. 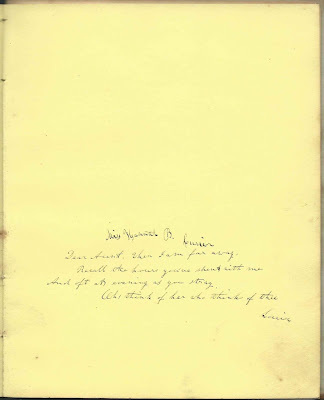 Louisa, who was born September 22, 1823 at Harpswell, Maine, was the last person to inscribe a page in Hannah's album, dedicated to "Dear Aunt" Hannah B. Currier, so the page must have been inscribed so close to Hannah's marriage, that Louisa felt like Hannah's niece already. Louisa would marry Richard Fay Proctor on December 9, 1852. Nehemiah Curtis Alexander died March 20, 1870 at Harpswell, Maine; Hannah died January 1, 1872, also at Harpswell. If you have corrections and/or additions to the information above, please leave a comment or contact me directly. Inscribed to Mrs. H. B. Alexander. 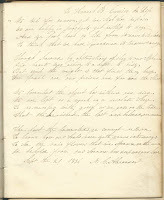 Not signed or dated, but after Hannah Ballard Currier's marriage to Nehemiah Curtis Alexander in 1837. Enna, inscribed to "Aunty Dear". Enna shared the page with "A Friend" who may or may not have been the same person. 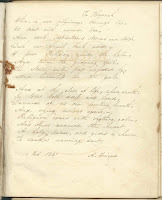 Enna also inscribed an individual page as Enna R. or Enna K., on October 25, 1846. H. M. 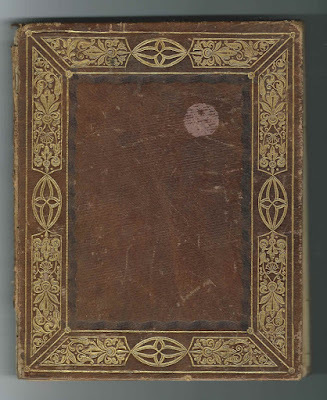 S?, inscribed on 14 February 1837; not sure of name. His surname might be Storer, Stover, Stain, Stone or ?, but it's interesting to note that there was a Henry M. Stone who married at Farmington, Maine, in 1837. 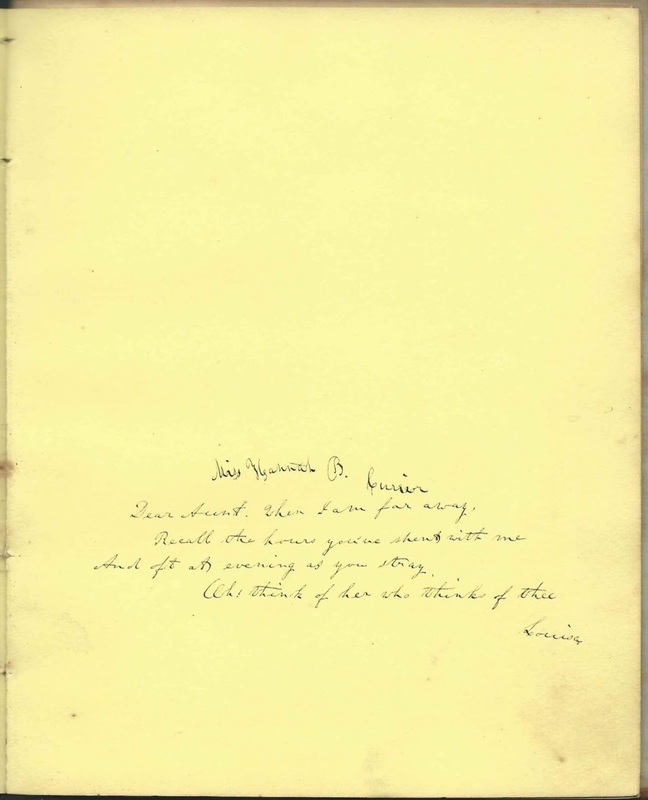 Louisa, inscribed to "Dear Aunt" Hannah B. Currier. Louisa Bishop, daughter of Captain John S. Bishop and Margaret (Alexander) Bishop, who was a sister to Hannah's future husband Nehemiah Curtis Alexander. Louisa would marry Richard Fay Proctor in 1852. This inscription must have been very close to Hannah's marriage for Louisa to use the term Aunt. Hannah and Nehemiah would name one of the daughters after Louisa Bishop. H. M. S?, inscribed on 14 February 1837; not sure of name. His surname might be Storer, Stover, Stain, Stone or ?, but it's interesting to note that there was a Henry M. Stone who married at Farmington, Maine, in 1837, and there was a Hannah Stover at Harpswell, Maine.